I was intending to do this up properly as an English scanlation, the first one I’ve attempted in years. The last time was back at the dawn of the century (that makes it sound historical, right? ), I tried my hand at Ariga’s Rockman X Mega Mission manga for the anniversary of Mega Man X Online (now The Mega Man Network). Long story short, that was a mess and I wasn’t happy with the results. I was hoping to capture the children’s story feel, but after treading water on this one for a month now, I’ve finally decided to just pair scans with translations and call it a day. Let’s go! Ta-dah! This is Rockman Dr. Wily o Yattsukero! !, or Rockman: Defeat Dr. Wily!! aka Nagaoka’s Petit Picture Books volume 3, from a series of cardboard books meant for Japanese young readers, starring heroes from television, manga and video games. 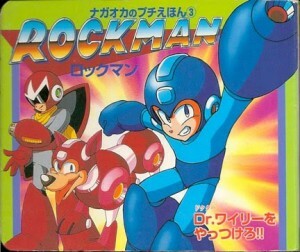 In 1996, they released this book starring none other than Rockman! This small 18 page book features a simple story and unique colorful artwork. And now, it’s scanned and translated! Click on the images to see the larger versions. Enjoy! One day, Rock and his friends set out on a picnic. “I’m going to go pick some flowers,” said his little sister Roll, as she and Rush ran off ahead. While Roll was picking flowers, she became entangled by a strange ivy vine. Oh no, Plantman was hiding among the flowers! Howling, Rush hurried back to tell everyone what happened. “You say Roll has been kidnapped?” exclaimed Dr. Right. “Doctor, I have to go save her!” With that, Rock changed into the heroic Rockman! At the secret base, Plantman was waiting. “You’re being fooled! Return Roll at once!” said Rockman. But Plantman just angrily attacked him instead! 2 Comments to "Rockman: Defeat Dr. Wily!! part 1"
The subject of Rush talking seems to change across different games and media. Sometimes he just speaks plainly, and other times he only barks or howls, but everyone nonetheless understands what he means. And then sometimes he’ll speak normally in Japanese but say “wan” at the end of his sentences, which might be considered roughly analogous to the Scooby-speak he would do in the Ruby Spears cartoon. But in general, he’s portrayed as speech-capable more often than not, even in the Captain N cartoon. He’s a robot, so why not?